There are some things that you do that stick with you for the rest of your life. The 2006 Patrol Challenge was one of these things. This event took us from the Devil’s Punchbowl down to Fireboat #2 in San Pedro. Through this event I have had the opportunity to work with my patrol, do new things and meet new people. Three of the people were the people in Toys ‘R Us who thought I was crazy as I asked them to stand on a pogo-stick while I took a picture of them. The clue that was the most fun for me was eating an ostrich burger at Charlie Brown’s. It was a little thick but very tasty. This was a very fun event that I intend to participate in next year. This event started out as just a little ride around LA, but soon became an exciting adventure. Driving around Southern California became a tiring but eventful weekend. We found new places that we never knew existed. We climbed mountains to get to a huge cross and jumped into a pool with our clothes on. The Patrol Challenge started off when we ran into the door of the Reseda Methodist Church. We were all overjoyed as we said the Patrol Challenge Pledge and got our clues. Excited, we got into the car and read them aloud until around 3am we were still figuring out clues. Finding a clue here, there, everywhere. Pictures were taken, items were collected. Eventually we all met back up at the house where we slept the first night. We discussed what we found and figured out clue #1. After much rejoicing we went back on our way and collected more and more items. The camel had been built the Friday before so now all we have to do is label. Racing to the finish line is hard work. But we’ll pull through; this is one of the last things we have to do because some of the things are impossible. We can’t wait till the end; we’ve become much better friends. So, we don’t care if we lose; there will be no boos. The name of our patrol is Battlesnakes. The reason why we’re called Battlesnakes is because the name was Rattlesnakes, but we misunderstood them and said it was Battlesnakes. Yesterday was very fun because we were exploring new and interesting places. The first thing we did was we went to the giant Coke bottle. Our very brave patrol then went down and up the steepest hills we’ve ever seen just to get to Baxter Street. See you next year. Boy, was our Patrol Challenge fun! First off we met at Cassidy’s house and sorted out the clues. We also met with other scouts on the Jamboree on the Internet! Under nickname Koala Dragon we chatted with guys from Europe, Australia and even ones from our District. JOTI is so much fun. On day 2 we first went to the Reagan Library. Then we went to the Skateboard Museum at Skatelab. Next we went to Theatricum Botanicum, then the Polo Field at Will Rodgers and talked to a Park Ranger. We went to Baxter and Lemoyne Street where the big hill was. My aunt was too terrified to actually drive. We switched drivers, took the picture and left. The parents refused to “floor it” down the hill unfortunately. For weeks now our leaders have been going on and on about this “Patrol Challenge” that we have been invited to. How we were going to have so much fun, and all the different activities, and things to collect etc. it sounded like a lot of fun too, for the first 20 times they told us. However, as time wore on and our schedules filled up the idea of spending a weekend running around the city did not appeal as it once had. The Monday before the event we girls considered canceling but decided not to because the leaders were so enthusiastic. Come to find out, as we were discussing this in the car Saturday night, the leaders did not want to go either! They were also quite busy and were beginning to think that they were too tired to go but they still came because they thought that the girls really wanted to go. This is no small source of amusement for us especially since we are all having a great time! This has been one of the most fun activities we have done for a while. We are all very talented liars, a skill that could be put to good use in international espionage, or selling Girl Scout cookies. We are a very good group because we were each willing to sacrifice our weekend for the others. Try new things because you just may like it. Through our years that we have been competing in the Patrol Challenge, we had lots of experiences. We were able to do so many things that we would never think of us doing in Scouting. We went to many places in Southern California outside our city and met new, nice, kind, strange, creepy and interesting people during the event. It was fun, amazing, interesting and tiring at times, but in the long run we prevailed by getting 1st place in our district 2 years in a row. HA, beat that! We also learn things from the clues we got in our packet, had fun solving puzzles and doing fun activities. It was a lot of fun and we hope to do it again. With the experience we have there were still some things that were pretty challenging. This Patrol Challenge was great and we’re hoping to compete next year in ’07. After tying last year with Troop 10 and coming in 2nd the year before to Troop 307 our one goal was to beat all the other Troops, and have a little fun at the same time. You know, a little bit of speed in solving the puzzles and clues, coupled with our collective intelligence, mixed with our uncanny resourcefulness and topped off with a bit of our 280 class, we were sure to win and we all went into the Challenge with excitement and determination. One thing I’ve always liked about this event is that it is a very welcomed break from the all too ordinary outside lives we all separately live. Knowing that I am a part of an organization where I get to learn new things, go places I wouldn’t normally go and experience situations in which my life outside of Scouting would not normally come in contact with fills me with such joyfulness. So much so that I have been waiting all year since the last Sunday a year ago when the 2005 Patrol Challenge concluded just for this one. After each year I always feel like I just got out of a rollercoaster, and I can’t help but think “let’s go again”. I would have to say that my favorite moment of the event was the infamous “Pool Picture”. The designers of this hunt gave 2 parallel locations: one for the easy-goers and one for the die-hard Scouts. Needless to say my Crew chose both just for extra points, the easier of the 2 was getting into an empty pool and the more difficult shot to capture: getting chest-deep in a filled pool. Luckily our advisor, Vinnie, had a pool in his backyard, but it was very cold. This has been my most memorable picture because never before have we had to so something this hard just for a few extra points. But it’s the little things that count and the memories I’m sure will last a lifetime with us all. More importantly though we have reinforced our team spirit within our Crew and shared in an event that we hope will live on for many years from now. Two Boy Scouts exit the Church; their names live in the most epic annals of glorious history of awesome Chuck Norris-like stuff… Matt and Matt. Lists of randomly assembled item in tow, they head out to the base of operations. They meet up with their girthy ally, Tim, Danny, the silent type, Sean that tall guy and Robert the Noob Slayer. Later they were graced with the presence of the albino-like Alex, most akin to the most epic heroic names such as “The Brave Little Toaster” and CEO of the MOIST skateboarding company. With the help of pizza they study into the night, researching locations, mystery clues, and laughing at things no man on earth would gather in 1 single location. The hunt was on! They awaken the following morning, hungry for fuel and victory. Losing Sean and Alex to the ravages of a full social schedule the patrol is down to 5. Many pictures would be taken, at UCLA, Big Boys, Lidos, the big cross by the Ford Theater, Temples by night, and water basins by day . an epic adventure to be told by the sages of the internet for many days to come. Items of random nature were everywhere! Pogo Sticks and hay bales and anchovies and Monopoly $ and other weird things clutter the car interior as the Boy Scouts make their way to CSUN. Our favorite activity in the Patrol Challenge was probably the hilarious pogo-stick picture. This was out first time participating and we felt like morons asking 3 strangers to ride on a pogo-stick in the middle of a parking lot. That 1 event cheered everyone up; we got the points, the picture and a few good laughs. And that was only 1 of the many good times we had. The Scout Patrol Challenge was a wonderful experience. I enjoyed going to different places and getting points that way. I enjoyed spending time with my fellow Scouts and having fun. During this experience I learned to be able to talk with people I didn’t know and be courteous and kind to everyone I asked a favor of. I don’t think I could have this much fun in 1 weekend or as many headaches, but it was still fun just the same. We were off. Hundreds of clues and things to collect, completely outrageous. Anyway, we didn’t care, we were going to win. The next mornings we all woke up about the same time. We immediately got to work by re-reading the clues and planning the day by figuring where to go, when to stop etc. Anyway by 9:30am we were ok and ready to go, we had a big day planned ahead of us. We came to realize at the end of the day we accomplished more that what we wanted to, so we were proud of ourselves. I thought the Patrol Challenge would be boring. We tried to make a 3′ tall camel. We slept in sleeping bags. We bought our food. I still think it’s boring. Today we’re going in a car on a scavenger hunt. We’re gonna have fun, fun, fun! We found stuff on the computer. The Patrol Challenge is now fun! Our 1st destination was the adobe schoolhouse. 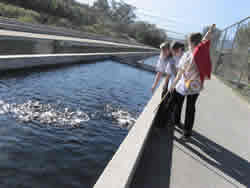 After visiting the schoolhouse we visited Castaic Lake in search of the Red Haired Siren of the Sea. We then went to a Twin Tower and Pentagon Memorial which contained the steel of the Twin Towers and the limestone of the Pentagon. Then we needed to go in a graveyard to find a person who died in the 19th century (Oh Great! A Graveyard!) it took minutes to find the dead guy, but we found him. Once upon a time there was a Venture Crew in the San Fernando Valley. Crew 22 was comprised of 3 handsome young men and 2 beautiful, patient and extremely knowledgeable Advisors. On this particular weekend, Crew 22 happened upon a remarkable adventure that spanned most of Ventura County and parts of Los Angeles County. There were many interesting sights on this adventure. They saw ancient buildings, oil industry relics and vintage aircraft. In addition, many experiences were had, there were many jokes told, phone antennas tickling ears and noses of sleeping Venturers. It was a wonderful time! We woke up at 6am, it was still dark outside. We were tired, but we were ready. Ready to slaughter the other teams. Stephen was sitting on Matthew’s sister. Move over! She said. We expected to have lots of fun, but it was more fun than we expected. Our patrol divided into 2 teams and we set off on our adventure. We gave our Patrol Yell and mounted up. We drove to a cemetery, it was scary, but we knew we would be ok.
After school on Friday, we did what we were all waiting for, the Patrol Challenge. Ed and Seth went with our Scoutmaster Cliff to the Church to pick up what would become the next 48 hours. We all met at the SPL’s house to begin researching the clues at our command post. Computers, laptops, maps, printer, phones, scanners and fax machines made up our HQ. We made calls to gather items, went to Google.com and “Google’d” the night away. Immediately following we Map Quest’d our routes that we would follow the next day. We all worked till 2 o’clock in the morning and camped outside in the backyard. We gathered all the items that we needed and labeled them. We went all over Los Angeles, Holywood, Hollywood Hills, Ventura County, Santa Clarita and all over. From amazingly tasty food establishments, to national monuments, to shops and stores; we did it all. Then came the coldest part of the challenge; the pool picture. We got into our Class A’s and got into a freezing cold pool and got the picture taken. Boy was it cold!!! Of course once we got out, a huge gust of wind hit us, and we were really cold!!! Now I’m here, writing this story, 30 minutes from arriving at CSUN to drop everything, then going back to my regular life. The most important thing about this trip is that we had a big blast of fun hanging out together. We can’t wait till next year to get to hang out again and find more and exciting clues. This weekend, my Troop and I participated in the Patrol Challenge. On Friday we slept in Emily’s back yard and figured out some of the clues. I have to admit it was pretty hard. One of my favorite places we went to that day was the Feline Conservation Center because I got to see all kind of wild cats! It was fun collecting all of the objects and deciphering all the puzzles. I really hope to do the Patrol Challenge next year because it was so fun. During the Patrol Challenge we went to Sonic Burger. We had tons of fun while being able to order from the car and then having them come to the car giving our food to us. If I was not in Boy Scouts I wouldn’t have experienced this which I would have hated to happen. I can’t wait till next year! This is our first time at the Patrol Challenge and we didn’t know what to expect. We went to William S. Hart park, we took a picture with a mule, saw a really neat mine diorama and we saw the first school house that was really small. Then we went to Castaic Lake and we found the Siren of the Sea. Then we went to the fish hatchery and got some fish food and fed it to them, they fought over the food when ever you threw food in it and it was very funny. 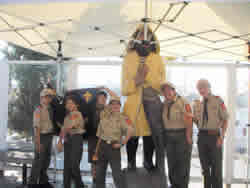 Then we went and had lunch and headed over to the grammar school in Fillmore and we saw the Boy Scouts there too. We went off to find the oil museum but went past it and found the monument to the brave police officers who helped save lives in the 2nd worst disaster. Then we went home and took the picture of us in the pool at 7pm and it was so cold in October. Well we loved it and thank you for having this Patrol Challenge, we plan to do this again, thank you very much! The Patrol Challenge was a wonderful challenge. I thought that the Girl Scouts would have a good time, but they really got into it and didn’t want to sleep or eat. I had a wonderful time getting to know some girls I didn’t know well yet. It was very hard to not tell them where to go or what to do, but they are amazing! I loved driving them and having them come up with the answers while we were driving. It was great to have the girls say, “Quick! Quick! Pull over there’s the fish hatchery!” They hadn’t known it was there but it was in their heads and it all clicked! I also enjoyed listening to the girls say, “Wow! This is California?” while driving to Fillmore. My house is a mess, my gas tank is empty, I am very tired, but my heart is full. I loved spending the time with these girls!!! It’s 10 o’clock at night and I’m standing chest-deep in the cold water of a swimming pool in full Scout Uniform. I’m surrounded by a group of Scouts, also in uniform, while a group of people stand on the deck watching and taking pictures. How did I get in this situation? It’s all in a day’s work as part of the Patrol Challenge. For the 3rd year in a row I have spent the weekend with Scouts in my Troop. We have driven all over Los Angeles taking pictures, collecting unique objects and eating unusual things. I have stayed up immeasurable hours, driven uncountable miles, stood by while the Scouts made the decisions and listened to them sing the Pokémon Theme Song (over and over again). After all of this there in only 1 thing I can say… I can’t wait till next year! During the Patrol Challenge we had highs and lows and everything in between. A high point for me was when we went to Fillmore and met Fredrick Everest at the Fillmore Train Station. After allowing the boys to look around the train museum he whipped out his Eagle Card from “1954”! He then gave us a 25 minute story on the history of the Fillmore Train Station. Overall I would recommend the event to every Scout Troop because we met so many nice people along the way. It was wonderful to learn about the history of the different places we visited in our very own backyard. Southern California has so many wonderful places of interest. What an adventure! This year’s Patrol Challenge was exciting, entertaining, rewarding, challenging, educational and overall, just plain fun! Being the first year that Girl Scouts were invited to participate, it was a huge success as far as our Troop is concerned. I believe, as a patrol advisor, troop advisor, and parent of both a Girl Scout and a Boy Scout, that this event has it all. The girls in our patrol were enthusiastic and worked together as a team to do their very best. They learned so much and took a historical trip through the cities, suburbs and rural towns, experiencing so many new places. I thoroughly enjoyed the Patrol Challenge and would recommend that all Troops take the opportunity and participate in this event. It is worth every hour spent with your Scouts. This is our 2nd year of participation with 2 of our 5 members having done this last year. We started out Friday night going over clues and list and using the internet. Our final day we made certain that our “Dog Scout” fit the uniform on hand and departed for downtown LA. The hills leading to Baxter and Lemoyne Streets were truly something to behold! We braved the challenge successfully. Navigating thru Chinatown to Olvera St. we stood beside Felipe de Neve and listened to TexMex music. Swinging by Avilla Adobe before entering our transport again and moving into the futuristic Gehry conception. From there we stepped back to Art Deco and the Coca Cola plant on Central. With that our journey will hopefully take us to CSUN with enough time to check in. Just call me “Wrong Way Haack”. My record of being on time and getting the directions right is less than expectable. So I volunteered to drive for the Patrol Challenge (it’s better than doing the navigating). I was impressed with how organized the Scouts were. They worked hard figuring out the clues, and then they found the best directions to the locations possible. There were maps and papers spread all over a big table and tacked up on the wall. We loaded up my little car and took off with great expectations and good spirits. What can I say, except that Jack Fishel and Paul Oliver outdid themselves again. Once again this year, they are not my favorite people. The swimming pool was really cold. And although it was an admirable attempt to allow adults to get some rest over the weekend by not letting anyone drive after 11pm, making a movie till 2:30am filled the spot of driving all over the county quite nicely. On a positive note, I totally enjoy this Scouting event. I get to see the young adults in my Crew make really hard decisions. Those decisions are born from a desire to win and built in morals to be fair and honest. I enjoy watching them pool intelligence and draw from each other’s strong points. The team spirit really comes out during this event. It is always fulfilling to watch some boys help the others as they split up certain tasks related to the event. I guess the best way to say it, and the best part of this event for me, is that this event actually shows an adult leader that all the time spent teaching and setting an example actually does good. Come 6pm the house will fill with 8 Scouts overflowing with energy, excitement and anticipation of the fun and adventure that awaits them over the next 48 hours. What happened next, and for the next day and a half, is hard to explain, and can only be expressed as “organized chaos”. The Scouts listened, then suggested variations to a very detailed, yet entirely half-baked plans on how best to collect the coveted Patrol Challenge points. Matt and Matt were baking a plan for constructing a 3′ high camel, while Sean imitated Christopher Columbus on the computer keys (i.e. discover a key and land on it) searching for answers to a myriad of clues. Robert took notes, Danny took requests and entertained on guitar and Tim emptied Mrs. Harry’s candy bowl piece by piece. After a trip to Home Depot, the camel construction was off and running. When Alex showed up Matt showed him the beginnings of a script for the movie; soon after, shooting began. I went to bed at 3am amid a hurricane of activity from the still pumped up Scouts. Yes, there’s nothing quite like the BSA Patrol Challenge, and I look forward to resting up for next year’s event!!! 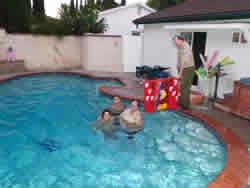 My Boy Scout Advisors journey began by being fully dressed and walking into a freezing cold swimming pool. A pool I have only been in twice in 12 years. The Tiger Patrol of Troop 22 all thought it was the funniest thing to see me, the Advisor, enter this unearthly environment. After cooking steaks on the BBQ we all started to map and brainstorm for this weekend adventure with other Scouts. This year, things went relatively smoothly. I am thankful that the Farrell’s Pig Trough activity was removed (I have enough trouble with my waistline, though Tito’s Tacos did not help much)! I certainly learned more about the history and hidden aspects of the city. The most difficult part of the activity for the adults was to keep our mouths shut! Maybe we can have 1 for our Scouters? Thank you for all your hard work and effort on behalf of the Scouts. Our 7 young Scouts worked very hard this last weekend on the Boy Scout Patrol Challenge. Since half of the patrol just transferred from another troop, this weekend gave everyone an opportunity to really get to know one another, as well as work as a team. The Scouts traveled near and far on a course similar to the “Amazing Race”. They went to places that they had never ever heard of and collected some unique items. The boys were very excited to solve the Mystery Clue puzzle and to be able to get bonus points at Castaic Lake. Nick, Chris and Devin were able to receive many bonus points just by meeting the “Red Haired Siren of the Sea”! The Patrol Challenge has been a real adventure. The adventure started on Friday when we were given our clues. One of the clues was to go to the Maritime Museum. The boys immediately did research and determined we had to go to San Pedro. We mapped out our adventure for Saturday and San Pedro was not on the tour. When our adventure took us north, we started towards one of the clues. But we could not find the adobe but we continued anyway – LOST – never to despair, the boys found a sign for a visitor’s information center. At the info center, it turned out that there was the Maritime Museum. The boys decided even though they had to go to San Pedro, they would go to the present Maritime Museum to find out how to decode signaling flags. When we walked in, to our surprise, the person who was there hands us a sheet and welcomes us like he has been expecting us and says, “We’ve been expecting you.” It turned out we did not need to go to San Pedro, but by getting lost, we found bonus clues and 3 additional photo safari pictures. What a great reward for getting lost. It was a crazy morning. I awoke at 6am to pick up the Scouts from their overnight location at the Church. I arrived to find wet Scouts from an early morning sprinkler awakening. At that moment I knew it I was in for a crazy day. My first rude awakening was that I could not give any help towards finding any of the clues. That alone was super tough. I did find that through a little coaching of how to approach people and being prepared with what to ask I could help the Scouts get more responses. Before I knew it we were taking pictures with people at Wal-Mart, standing with people in Toys R Us with pogo-sticks in hand and taking pictures with bikers shopping for new bikes. I was totally proud of our Scouts and the personal growth I witnessed happening within them. It was our Troop’s first Patrol Challenge and man was it great. With proper preparation from the Scouts this could be an amazing lesson of what one can accomplish in 1 ½ days. What a awesome activity! We had so much fun! My experience working with the girls on this was very interesting. First we drove out to the Antelope Valley where we visited the Feline Conservation Center. The big cats out there were beautiful. We worked our way back toward the Santa Clarita Valley. Along the way we ran into and came across many strangers that were very willing to help us in our journey. On the way back to Santa Clarita we ran into a biker group that once finding out it was for the Girl Scouts was excited about taking a picture with the girls. All together, I had a great time and it was very fun. My patrol decided to try to find the location of the Lost Popcorn Seller, clue #86. We were able to get a leg up on this location by heading to a GPS location that was close to the location of the Popcorn Seller. We got there with about an hour of daylight left. We found our first waypoint, “The Messages in Mud and Dust”. It was a sign on a nature trail about animal tracks. We took our bearing and headed out, found our next stop then we logged our 1st visit in the Cache Log. Got a Bonus List of locations and hints out of the cache and started back to the car. Greatly enthused, we even had enough time to find another GPS Geo-Cache site that was close by. We got to the car and started down the hill. All of a sudden someone remembered that we didn’t take a patrol picture of our visit to the Popcorn Seller. Ahhhhuuuurrrgggg. So we parked and headed back in. By this time it was getting pretty dark. But using the good Scout skills of staying together and retracing our steps, with only a few missteps, we re-discovered the Popcorn Seller and headed out. By now it was very dark but we found the car and escaped the hill in 1 piece. 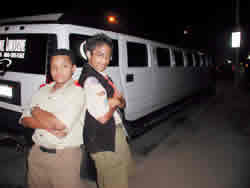 Then at the bottom of the hill, as we were driving out, we spied a Hummer Limousine. It was one of the Bonus Locations that we just received as a bonus for finding the Popcorn Seller. We got a nice couple to take our picture and then we got to go home. All ended well. As Patrol Advisor I enjoyed watching the Scouts try and solve clues and search the internet for answers. We had a good time driving around different parts of LA we normally don’t see.